BEIRUT, June 7 (Reuters) - Six hours after tanks and militiamen pulled out of Mazraat al-Qubeir, a Syrian farmer said he returned to find only charred bodies among the smouldering homes of his once-tranquil hamlet. Until now a bloody 15-month-old revolt against Syrian President Bashar al-Assad had barely touched Mazraat al-Qubeir, whose residents had taken little part in the uprising. On Wednesday, the conflict came to them. Army tanks surrounded and shelled the hamlet in the afternoon before rolling in, joined by pro-Assad shabbiha toughs on foot, armed with knives, guns and clubs. Reuters could not immediately substantiate the man's story, but it chimed with several accounts by opposition activists who said they had talked to survivors of the attack. United Nations monitors, who verified a massacre in which 108 people were killed in Houla on May 25, are investigating. Their commander said his men had been turned away by troops at checkpoints and civilians on Thursday and U.N. chief Ban Ki-moon said the monitors had even come under small-arms fire. A pro-government Syrian television station said the U.N. monitors had eventually reached the village. Ban described events there as "unspeakable barbarity". Activists say at least 78 people were killed, most of them from one extended Sunni Muslim family living in a score of farm houses on the flat fertile land northwest of the city of Hama. Rising sectarian tensions have sometimes led to bloodshed between rebellious Sunnis and minority Alawites who belong to the same Shi'ite Muslim offshoot as Assad himself. Syrian authorities denied reports of the killings, which resembled accounts of the Houla massacre, saying security forces had confronted "terrorists" who killed nine women and children. Some activists said anti-Assad insurgents had been operating in areas near the village, home to about 150 people, who may have been targeted in revenge or as collective punishment. But most said Mazraat al-Qubeir had never joined the revolt against four decades of Assad family rule. The hamlet lies about 20 miles (13 km) northwest of Hama, where forces loyal to Assad's father crushed armed Islamist uprising 30 years ago, killing many thousands of people and razing whole districts. 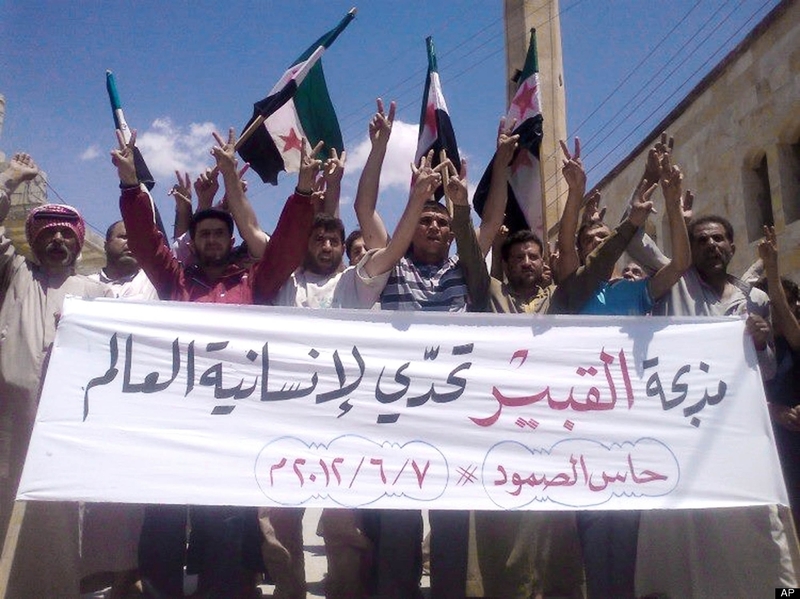 "They were peaceful Syrians, neither with the regime nor against it," said one activist, who called himself Abu Ghazi. He named 54 people killed, all but a dozen of them from the al-Yateem family. Three were listed as three years old or younger. The witness, who claimed he was a Yateem family member, said he had spoken to his brother on a cellphone as gunmen rampaged through the town. "The last conversation we had, I told him I saw the forces coming to our house," he said. One activist said Alawites living nearby were responsible. "Many young men from the Alawite villages around al-Qabeer have died fighting for Assad against the rebels," said Manhal Abu Bakr. "They wanted revenge, and so they took it out on the nearest Sunni village." Some 24 victims have yet to be identified, Abu Ghazi said, some because their corpses were so badly burnt. He said many other bodies were dragged away to a nearby Alawite village. Video footage released on Thursday showed the bodies of at least a dozen women and children, wrapped in colourful blankets and white burial shrouds, packed with frozen water bottles for want of a morgue or any other refrigeration. Activists said they included a grandmother, her daughter and five grand-children killed in Mazraat al-Qubeir. Charred remains, possibly human body parts, were also visible. "These are the children of the Mazraat al-Qubeir massacre... Look, you Arabs and Muslims - is this a terrorist?" asked the cameraman, focusing on one of the dead infants. The killings came less than two weeks after the massacre in Houla, in which children accounted for nearly half the dead.